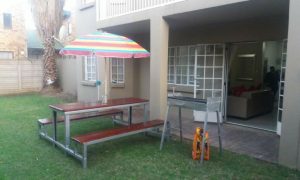 2 Bedroom fully furnished ground floor apartment with garden and braai facility to let in Bloemfontein. 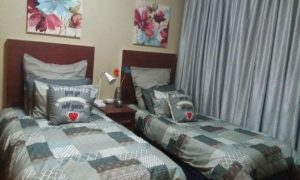 Can sleep up to 5 guests. 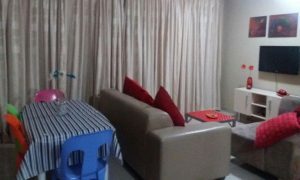 Satellite TV with OVHD package available. 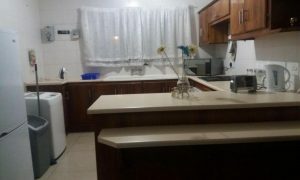 Kitchen is fully equipped with built in cupboards, Fridge freezer, oven and stove, washing machine (for clothes), microwave. The complex is secure and we will provide you with a remote for the gate. Under cover parking is available. 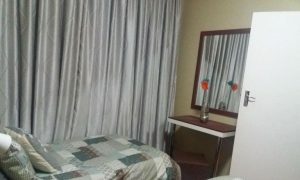 Meals and laundry are available on request. University of the Free State 1.7km. 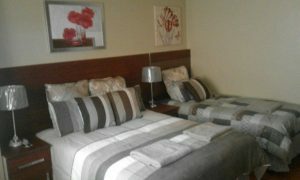 Price per night is R800. 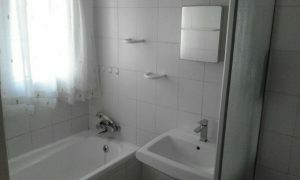 Photos of the apartment as below.